We are always finding new and exciting ways to benefit from the therapeutic value of raw and organic coconut oil. Never mind that it’s usually kept in the kitchen, organic, extra-virgin coconut oil can be used in plenty of ways in every room of your house—especially the bathroom! Here are 15 reasons why you should be keeping it in yours. Add 1 tablespoon of coconut oil to your roots, and then massage it down toward the ends of your hair. Leave it in for at least one hour before washing or rinsing with warm water, or cover your hair with a shower cap and let it soak in overnight. Fight oral bacteria, fungus, toxins, and parasites with oil-pulling. Swish around 1 tablespoon of coconut oil in your mouth for 10-20 minutes first thing each morning on an empty stomach. Spit it out when you’re done, and rinse your mouth out with water. Coconut oil can be used as a natural, inexpensive makeup remover, as it can take off even the most stubborn mascara and eyeliner residue with ease, while moisturizing at the same time. Use coconut oil as a moisturizer on your face before bed, on your hands after you wash them, or on your whole body after you shower. Remember, a little goes a long way! Before you finish your morning routine, gloss over your lips with some coconut oil, which will leave them looking and feeling great, as well as protect them from environmental pollution and toxins throughout the day. Many antiperspirants contain a ton of synthetic chemicals, as well as aluminum—which has been linked to the development of Alzheimer’s, and can even make you smell worse over time. You can use a pinch of of coconut oil and a drop of an essential oil like lemon or lavender instead. If you want soft, smooth, rash and razor burn-free skin, try replacing your shaving cream with coconut oil, which is both antibacterial and soothing. Yep, you can actually wash your face with coconut oil! It’s called oil cleansing, and it involves mixing equal parts of coconut oil and castor oil, massaging it into your skin, and then wiping it off with a warm washcloth. See here for more detailed instructions. Coconut oil is great for treating any mild allergic reactions or rashes you or your kids may develop, including diaper rash! Massage coconut oil in and around your nail beds a few times per day to treat and prevent dry, flaky cuticles. Apply coconut oil to the bottoms of your feet after you shower to help nix fungal infections like athlete’s foot. Mix a spoonful of coconut oil and a few drops of your favorite essential oils into the tub for a luxurious, fragrant, and moisturizing bath. Make an all-natural, bacteria and plaque-fighting toothpaste by combining ½ teaspoon baking soda, 1 teaspoon coconut oil, and 2 drops of peppermint essential oil in a small dish. Put it on your toothbrush and brush as usual! Mix equal parts of coconut oil and sea salt (or sugar or baking soda) to make body scrub that’s both exfoliating and moisturizing. Apply while you’re in the shower, and then rinse off. Apply a few drops of coconut oil to wet or dry hair to fight frizz throughout the day. As you can see, coconut oil’s usefulness spreads far beyond cooking; it can also be used in a ton of other ways to support greater health and beauty. What other nifty ways do you use coconut oil? 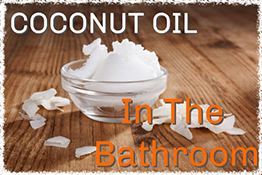 Hey Buddy!, I found this information for you: "15 Reasons to Have Coconut Oil in Your Bathroom". Here is the website link: https://www.thealternativedaily.com/15-reasons-coconut-oil-bathroom/. Thank you.